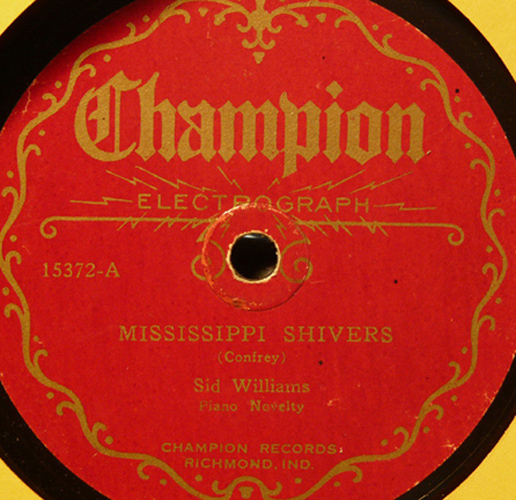 June 17th in Gennett History, 1927: Pianist, Sidney Williams, recorded “Mississippi Shivers” in St. Paul, Minnesota. The recording appeared on Gennett 6353, Gennett Personal 20339, Champion 15372, and Herschel Gold Seal 2020. The Champion issue sold approx. 3,000 copies between 1927 and 1929. This entry was posted in Champion, Gennett, June and tagged Champion 15372, Gennett, Gennett 6353, Gennett Discography, Gennett Personal 20339, Gennett Records, Herschel Gold Seal 2020, June, Sidney Williams. Bookmark the permalink.